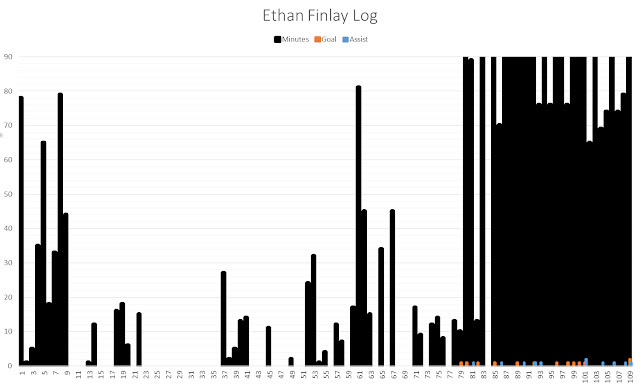 It took Ethan Finlay 2 years, 2 months, 40 appearances and 890 MLS regular season minutes to get his first goal or assist but since then he has been on fire. In this last 9 months, 30 appearances and 2391 minutes he has 13 goals and 11 assists. That puts his Goal + Assist per 90 minutes (G+Ap90) at 0.90 rate. I've been tracking MLS players since the beginning of 2011 and that puts him in the upper tier (basically anything over 0.70 G+Ap90 is league leading). Finlay's first appearance in a MLS games came during the first game as a pro. He was on the bench but an injury to starter Dilly Duka saw him come on in the 12th minute. Finlay got off a couple shots with one on target in 78 minutes of play. It was a forgettable loss to Colorado. Coach Robert Warzycha must have liked his effort there because he gave him a few more looks in the coming rounds, till ultimately Finlay found himself in the role of "squad rotation player." It would be 80 Crew games before Finlay finally completed a 90 minute game. It's interesting for me to look at a player log like this. Both Warzycha and Berhalter went fishing with Finlay off and on for a long while. No doubt giving him opportunities because of his work in training and preseason (which he had a couple solid ones). Can't overstate how rare this sort of thing Finlay is doing is in MLS. I've got to think Crew SC assistant coach Josh Wolff has a good bit to do with it but regardless... Rare.